Coverage: Watch live on BBC One or Two, BBC Sport website and app from 13:00 BST. Live commentary on Radio 5 live sports extra on Friday. 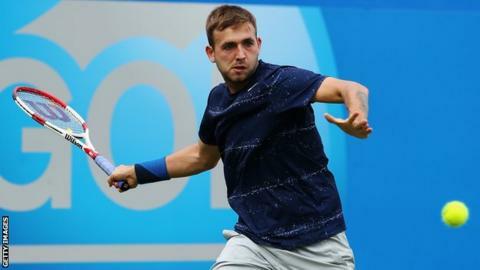 World number 300 Dan Evans has been given a surprise call-up for Great Britain's Davis Cup semi-final against Australia in Glasgow. The 25-year-old British number eight has been selected ahead of James Ward and Kyle Edmund in the singles. Andy Murray will play Thanasi Kokkinakis in Friday's opening singles at 13:00 BST, followed by Evans against Bernard Tomic. Britain are trying to reach their first Davis Cup final since 1978. GB captain Leon Smith also named Jamie Murray and Dom Inglot for Saturday's doubles, although nominations can change up to an hour before play, so Andy Murray could yet feature. "It wasn't an easy one," Smith said of the decision to select Evans. "Having thought about it a lot, the fact that Dan has played an awful lot of tennis this summer, he's won a lot of matches - albeit mostly at Futures level. "Winning really helps and he comes in with a lot of confidence." Australia captain Wally Masur selected former world number one Lleyton Hewitt and Sam Groth for the doubles. The best-of-five tie opens with two singles matches on Friday, followed by the doubles match on Saturday and the reverse singles on Sunday. The winners will play either Argentina or Belgium in the final. Evans has won 29 matches on the lower-level Futures circuit since Wimbledon, winning two titles and coming through qualifying to reach the semi-final in Vancouver. He also beat Tomic during a memorable run to the US Open third round two years ago. However, Evans was left out of Smith's original squad for the Davis Cup semi-final and only brought in earlier this week as cover for Edmund, after the 20-year-old fell heavily during practice. Ward has played the second singles role throughout Britain's 2015 campaign, producing the best performance of his career to beat American John Isner in Glasgow in March. The Londoner is enduring a desperate run of form, though, and has lost his last 10 matches, while Edmund has never played a Davis Cup tie, opening the door for Evans to make a surprise return. "Leon said someone was injured and asked me if I'd come to be on standby, and I said yes," said Evans. "It was a good opportunity to be around the guys again; I haven't been in this environment for a while, so I just came up for a practice week basically and obviously things worked out a bit different." "The indication from the captain is that Kyle Edmund would very likely have played if he had not turned his ankle on Tuesday, but this still represents a big gamble - when the stakes have never been higher. There is no doubt Evans is in form (he has fought his way back to 300 in the world, having been 772 as recently as May), and has at times shown a flair for the big occasion: in the Davis Cup as well as at the US Open. But this year - playing predominantly in the third tier of men's tennis - Evans has beaten only one Top 100 player, and just four others from the Top 200. Leon Smith has never shied away from making a tough call, and has barely put a foot wrong as captain. His 'gut instinct' should be respected, but will it be correct? "Yeah, we were all surprised," Tomic said of the news that he will be facing Evans. "Obviously they picked him for a reason - the fact he did beat me in the US. For sure it's going to be a tough match and I'll have to be ready." Masur added: "As a captain, you make decisions based on what is right at the time. Then you get judged in hindsight. "So if Leon gets it right, he'll be a genius. If he doesn't, there will be people ready to stick it to him." iWonder: What makes the perfect serve? Read more on iWonder: What makes the perfect serve?